From customers themselves to contractors, from West coasters to Midwesterners to East coasters, even Canada, and International (per email request), Inline Design communicates with and accommodates the needs and wants of a variety of individuals. Kristen was no exception to this. In the summer of 2018 — June 18 to be exact — Kristen of K Scholz Design & Build (based out of a suburb of Columbus, Ohio) reached out to Inline Design, asking about the stainless steel Seattle Bar Railing System. Unfortunately, no one or company is perfect, and not all projects are smooth-running all the way through. Kristen’s process was one of those rough-running projects. However, due to consistent communication and all hands on deck, it was topped off with a happy ending. Kristen was working as the professional installer — optional, but occasionally recommended depending on your skill level — for a large exterior area in someone’s home. The exterior area features a large wooden deck, with wooden stairs connecting said deck and concrete stairs. The concrete stairs enter an entertaining area, with seating and other features including a fire pit, accented with gray stone. It was a big project, requiring an element of safety and aesthetics that would complement each feature in the area, even bring each feature together fluidly. Inline Design’s Seattle Bar Railing System checks off each of these requirements, all while being affordable, low-maintenance, suitable for all kinds of weather, and easy and simple to install. About an hour after Kristen’s initial reaching out, she received a reply via email, and on June 25, she sent over some drawings and a request for a quote. A day later, an initial quote was sent to Kristen, along with the clarification of some of the details, including the brushed/satin stainless steel finish. This finish is similar to that of stainless steel appliances in any home. When a quote is sent, it is important to take into consideration which product a customer wants, as each product has their own unique features and pricing. Kristen opted for the Seattle Bar Railing System. Some of the features of the Seattle Bar Railing include, but are not limited to: one integral piece rather than two detachable components, adjustable flush angles, slim and sleek bar holders, and smooth edges.The Seattle Bar System also has a new insert, which makes for easier installation, and comes in either side– or floor-mounting. Less than a month later, the first shipment of bar railing was in Kristen’s hands, ready to install. However, the first hiccup occurred: some balusters for the concrete stairs were missing. This hiccup was quickly solved, and those balusters were sent off to Ohio immediately. Some customized items weren’t going to work for the space, and customized items cannot be returned. A week later, Kristen was offered a 5 percent discount on the order that was needed, for her to complete the exterior area (she had also received a 5 percent discount on the first order). Because the exterior railing was coming together beautifully, as she put it, there was talk of putting a cable railing on the interior staircase. While the interior staircase is narrow, Inline Design’s cable railing works well for all kinds of spaces, even narrow staircases. Cable railing is unobtrusive to views, while also not taking up a lot of space, making it optimal for exterior areas with great views and features, and compact interior areas in which not much space is available. About two weeks later, as things were finishing up, Kristen realized she needed a few more parts to complete the space. To ensure the space was finished quickly, 2-day shipping was put into place for these parts. By the time fall of 2018 arrived, the project was completely culminated. 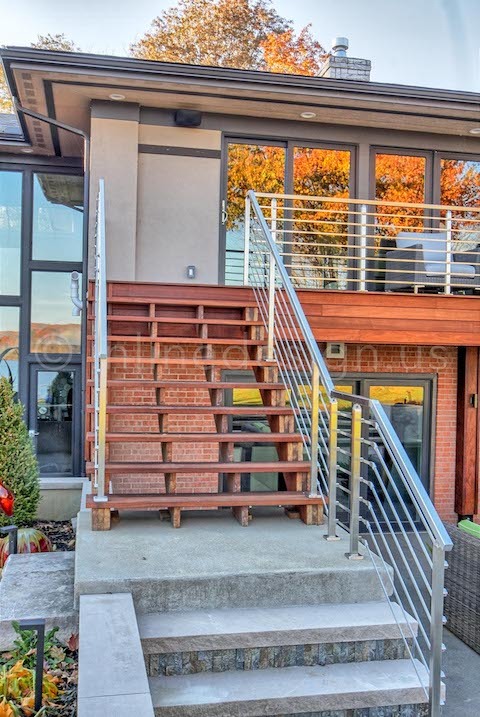 There was an open feel in the exterior space, allowing for each element of wood and concrete to uniquely stand out and making for an aesthetically pleasing entertainment area at the end of the stairs, below the deck space. Because of how beautiful the bar railing came out, and how swimmingly the hiccups along the way were resolved, Kristen praised Inline Design for the consistent communication and patience.